Wendy's New Baconator Fries Are Here, And They "Respect the Bacon"
Bacon is the delicious fabric that holds America together. That's why, just in time for the Fourth of July, Wendy's has taken its beloved Baconator cheeseburger and given it the sidekick it deserves, Baconator Fries. 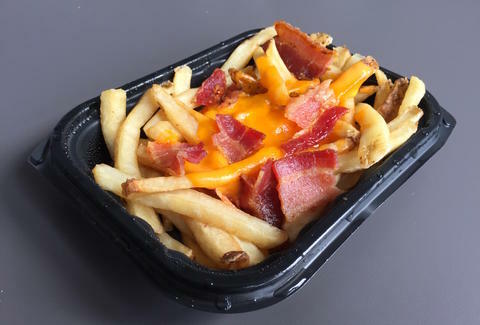 Specifically, the red-headed fast food chain describes the Baconator Fries as, "a delicious blend of warm cheddar cheese sauce, freshly cooked Applewood Smoked Bacon and shredded cheddar cheese drizzled over Wendy's natural-cut fries." In other words, they're cheese fries. With bacon on top. We went to Wendy's and tried 'em, and can confirm that's exactly what they taste like, too, but we never really doubted them. We recommend eating them with a fork -- not because we care about getting our fingers dirty, but because it's the fastest way to shovel all the cheese, bacon, and fries into our mouths. The fries are available only for a limited time, so don't miss out on pairing your cheeseburger covered with bacon with fries covered with bacon like a real American. 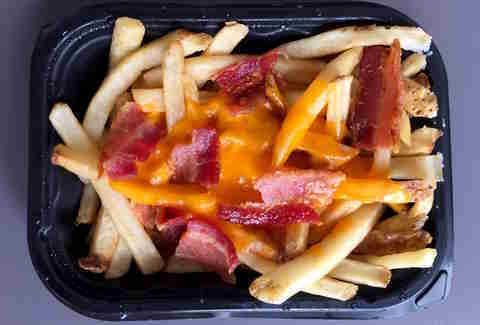 Tony Merevick is Cities News Editor at Thrillist and his diet begins in 3, 2, 1 .... Oooo bacon cheese fries! Send news tips to news@thrillist.com and follow him on Twitter @tonymerevick.